24 Then Jesus told his disciples, “If anyone would come after me, let him deny himself and take up his cross and follow me. 25 For whoever would save his life[a] will lose it, but whoever loses his life for my sake will find it. 26 For what will it profit a man if he gains the whole world and forfeits his soul? Or what shall a man give in return for his soul? I chose these earrings from my jewelry box to adorn my Mother for burial. I could not just run out and find earrings because my Mother did not have pierced ears. I had saved earrings for her but they were pearls and that just would not do so I handed the funeral director my beloved clip-on rhinestone earrings. 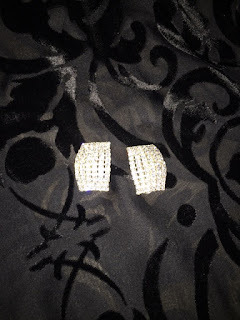 Two weeks ago, I opened a bag from my parent’s home that I had forgotten about and to my amazement, the same exact earrings I had given to her, she returned back to me. Why keep what you have and lose it all. When you deny self and take up your cross, God returns much more that what you gave up. Self-denial is definitely a four letter word spelled, LOVE.